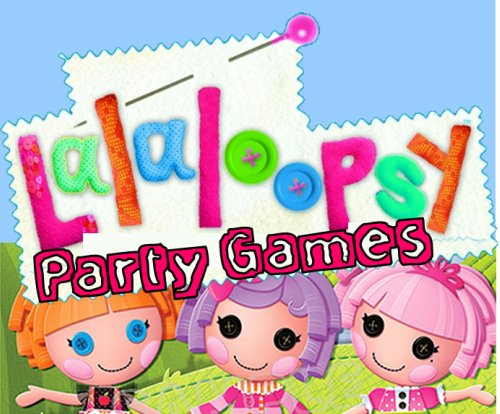 Funtastic Lalaloopsy Party Games, Printables, and Ideas! Is your daughter Gaga for Lalaloopsy. Use the fun DIY lalaloopsy party games and our funtastic lalaloopsy printable party supplies below to make her party SEW perfect. The lalaloopsy craze is big right now and little girls across the country are clamoring to build their collection. You would think that the party ideas and supplies would be more ample, but I discovered, along with many other parents, that they are lacking. Stress no more, Party Games Plus is here : ). 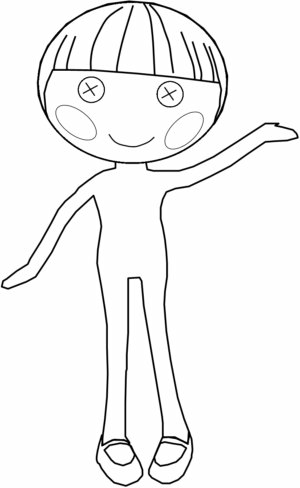 Print out our free lalaloopsy doll base image (here ) and let the guests create their own loopsy doll. You’ll need to purchase a variety of fabric remnants from your local craft store (if you already some some even better), a couple different colors of yarn for hair, and of course buttons. Provide the guests with craft supplies, scissors, and glue and let them create their own lalaloopsy doll. Make sure your print the doll image on sturdy paper such as card stock so that it will hold the glue and fabrics. Let each girl name their creation and tell a little bit about it. A trademark of the lalaloopsy doll is their button eyes and accessories. The following are a couple of simple games using a button theme. Find the Buttons Purchase a variety of buttons from your local craft store and hide them throughout the playing area. Have the girls hunt and find as many buttons as they can. Button Toss Have each guest take turns tossing ten buttons into a bucket a few feet away. Loopsy Loopsy Where’s Your Button A twist on the ol’ game of Doggy Doggy Where’s my bone. One child turns her back to the other guests and places the button behind her. One of the other guest sneaks up and take the button and hurries to sit back in her place. All the guests then call out ”Loopsy, Loopsy where’s your button?” and the guest playing loopsy must turn around and try and guess who is holding the button. If she guesses right she gets to remain Loopsy, if she guesses wrong the person who took the button becomes the new loopsy. Jewel Sparkles dress was made from remnants of a real princess dress they say. She loves all things beautiful and can usually be found dancing. Put on the some music and have all the girls show off their sparkly moves. When the music stops, they then everyone must freeze. Whoever is caught moving must sit out until the next round. Play until only one girl is left. Prairie Dusty Trails was sewn from a cowgirl’s vest. She’s a rowdy buckaroo who loves all things western. To play her lasso party game you’ll need a hula hoop and a loopsy doll. If you don’t have a loopsy doll available you can really use any item that the hula hoop will fit around. Set the doll up about five feet away from where the players will stand. Give each girl three tries to loop the loopsy doll. Crumbs Sugar Cookie was made from pieces of a baking apron and sewn on National Cookie Day. She can’t help but crave cookies and sweets. Hide everything you need to bake sugar cookie around your party area. You can even use clever clues and riddles to give them hints about where the items are hiding. Once they find all the items needed to bake the cookies let everyone join in the baking fun. The rewards for playing this game are SEW sweet. Let the girls make their own lalaloopsy bracelets and necklaces. Provide buttons, beads, string, scissors, and other fun items. You could also print our free lalaloopsy bottle cap inserts here and have each guest create a loopsy bottle cap necklace as a party favor. Bottle cap necklaces are really popular but you will have to do some prep work for this project. If you’re up to it, check out the tutorial here . Get Your complete Printable Lalaloopsy Party Supply personalized with your child's name, age, and party information. Order your set today for $24.99! 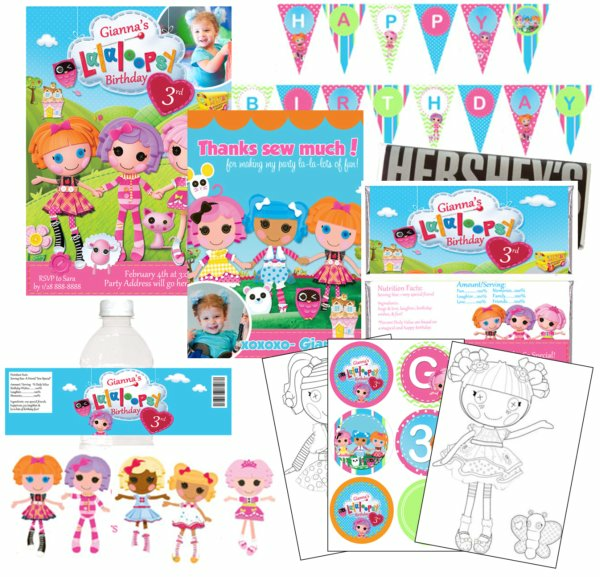 Once you complete your order you will receive your printable lalaloopsy party supplies within 3-5 days. To get started on your order fill out the form below. After I receive your order I will email you requesting an image. Please look over here .